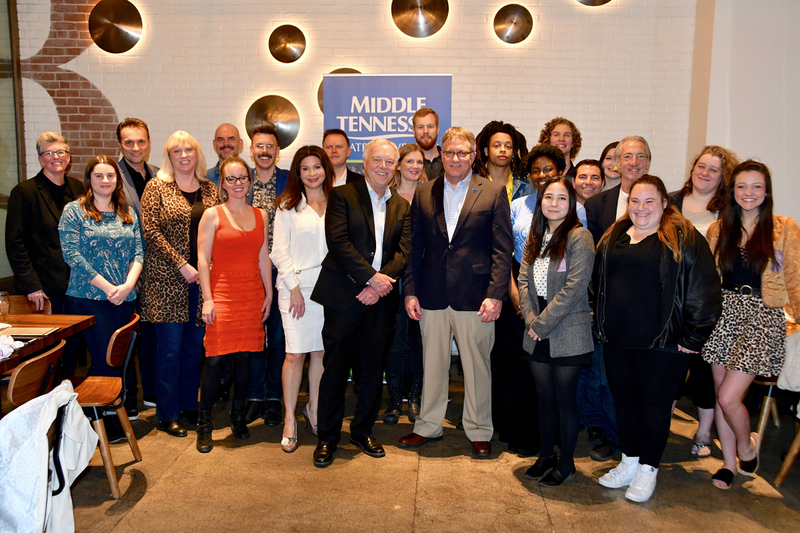 MTSU design alumna Ayana Ife w..
LOS ANGELES, Calif. — Middle Tennessee State University students and faculty connected with Southern California alumni and recording industry executives Friday, Feb. 8, on its first full day at the festivities before the 61st annual Grammy Awards. Six students from the MTSU Department of Recording Industry, who were selected by chair Beverly Keel to represent the university, went backstage and on stage Friday as the Recording Academy prepared Staples Center to host the national telecast Sunday, Feb. 10. 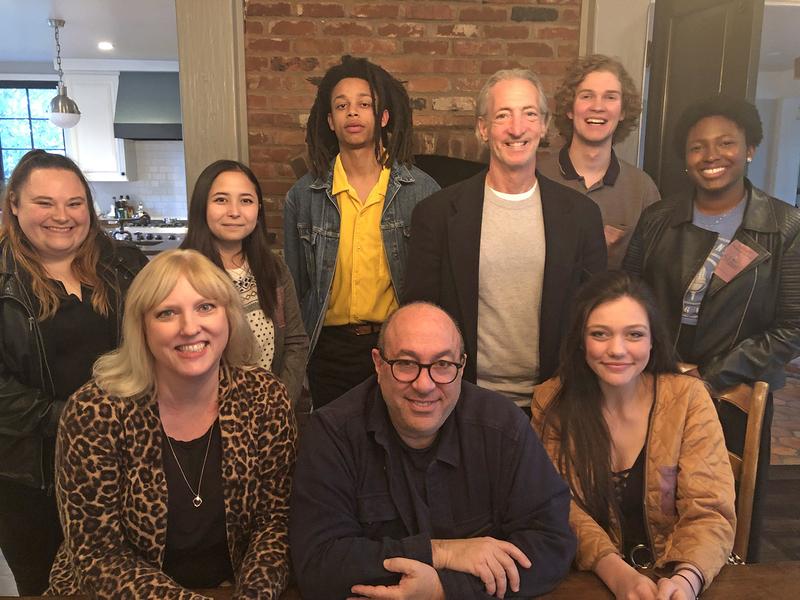 The students, along with professor Matthew O’Brien, also met with Billboard magazine’s west coast editor, Melinda Newman, and A&R executive Jay Landers, who has worked with a stable of renowned artists that includes Barbra Streisand, Frank Sinatra and Bette Midler. 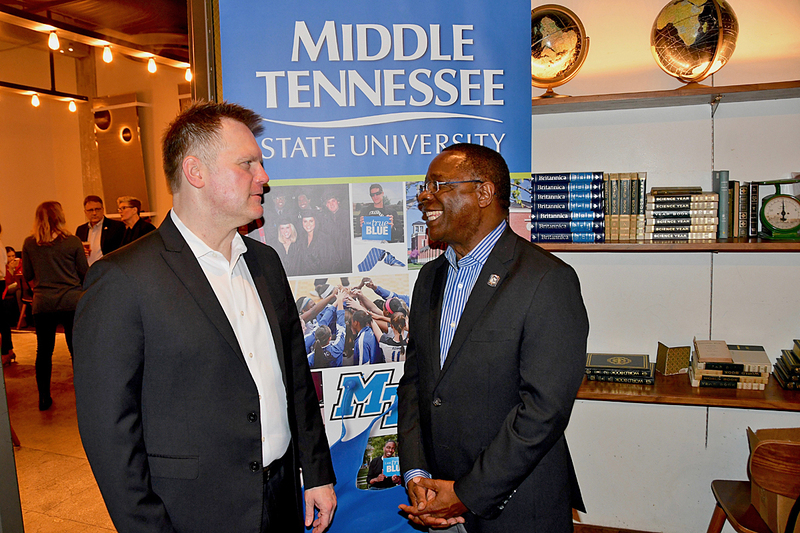 The day concluded with President Sidney A. McPhee, Provost Mark Byrnes and Ken Paulson, dean of the College of Media and Entertainment, hosting a reception for Southern California members of the MTSU Alumni Association. The event allowed the area’s graduates to provide career advice and insights to the six students. “The reason we come to the Grammys, now six years in a row, is not only to underscore the impressive footprint of our graduates in the recording industry but to provide these students such amazing opportunities,” McPhee said. Junior Micaela Griffin was wowed after learning all that the Recording Academy does to prepare for the Grammys, the industry’s largest and most prestigious event. “I’ve gained a more vast understanding of everything that goes into the planning and production of the biggest night in music,” she said. “It was amazing to see so many MTSU alumni working these positions as well,” she added. One of those MTSU alumni is Garry Hood, who’s spent the last three decades as the head stage manager for the biggest award shows on TV and again will be in charge behind the scenes at Sunday’s Grammys event. Bicknell, Griffin and Madigan were joined by three fellow recording industry students: seniors Neeko Crowe, Trianne Newbrey and Austin Sawyer. On Saturday, Feb. 9, MTSU held a brunch at The Standard hotel in downtown Los Angeles in honor of repeat Grammy-winning songwriter/producer and 2003 music business alumnus Torrance “Street Symphony” Esmond, who’s recognized this year for producing “Hussle & Motivate” on Nipsey Hussle’s best rap album-nominated “Victory Lap” CD. In addition to Esmond, eight other university-connected people contributing to rap, Americana, country and gospel projects are set to be recognized with nominations at the awards ceremony.